One of my favorite new finds at CHA was one of the latest releases by Core'dinations -- the Jenni Bowlin Core Impressions collection. 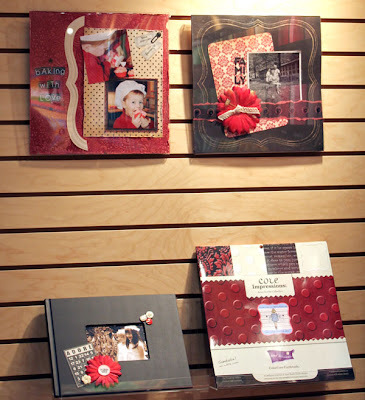 The pack consists of Core'dinations color core cardstock, pre-embossed with classic Jenni Bowlin patterns: damask, label, text and polka dots. Each of the patterns comes in five colors: scarlet, vanilla cream, hypnotic, hermit, ruby, or in layman terms - shades of red, cream and black. The pack will be shipping in September. I know I can't wait to play with them. I am in LOVE with the Coordination cardstock and so this will be a MUST have supply!!! Jennie Bowlin is one of my favorites!!! This is a great idea, I can't wait to get some! I hope they do this in other color combos too. what a cute idea -- can't wait to try some! Love the color combo! Great looking papers! Oh wow, I can't wait to play with that amazing collection. Just signed up for a core' dinations class at ckc I LOVE both of these products can't wait to get them and play with them!!!! What geniuses we have in the scrapbooking. Two of my most favorite things in one!!! I cannot wait to get my hands on this! I have become such a Jenni Bowlin addict. 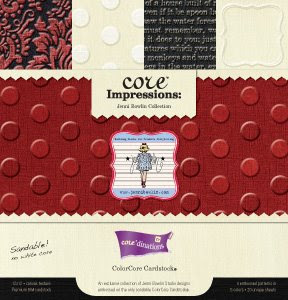 It started with those fabulous giant labels and now I can't wait to get my hands on the core Impressions paper! Keep it coming!